Conrad J. Sack, D.M.D., M.S. has been involved in dentistry for more than twenty years. He has a special interest and expertise in the growth, development, and management of the craniofacial complex in the young growing patient. He has developed unique skills in the use of removable appliances in his treatment approach with wide patient satisfaction. Dr. Sack received his Doctor of Dental Medicine degree from Boston University in 1983, after which he attended a post-doctoral program at U.C.L.A. earning a specialty degree in Pediatric Dentistry and Orthodontics and a Masters in Oral Biology. He is on the faculty at U.C.L.A. 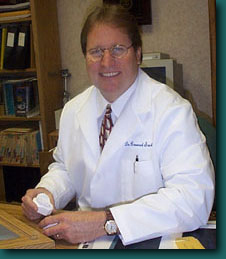 Department of Pediatric Dentistry and Orthodontics, while he is also past president of the local American Society of Dentistry for Children and the U.C.L.A. Orthodontic Alumni Association. Dr. Sack has lectured nationally on the special areas of Crozat arch development. Because of his expertise using Invisalign, Dr. Sack has been asked to teach other orthodontists and dentists his techniques at UCLA and at various continuing education events.